The Polisario Front continues to violate the provisions of the ceasefire agreement that the UN Mission for the Sahara “MINURSO” has been monitoring in the buffer zone since it was signed in 1991. In the semi-annual report on the Sahara that he must submit later this October to the Security Council, the UN Secretary General, Antonio Guterres, notes the serious tensions between the MINURSO and the Polisario leadership. The Polisario, in violation of the ceasefire agreement, obstinately tries to shift the venue of meetings with the MINURSO civilian and military officials from the Rabouni camp located in southwestern Algeria, to the localities of Bir Lahlou and Tifariti, in the buffer zone to the east of the Moroccan defense wall and that the Polisario allegedly calls “liberated territories”. 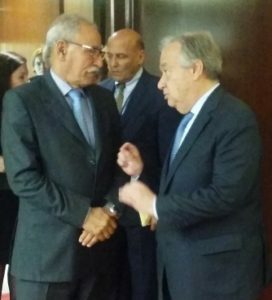 According to Guterres, the Polisario leader Brahim Ghali refuses to officially receive his Special Representative in Rabouni, “in line with a long-established practice” and “insists that the meeting be held in the Western Sahara territory” in the buffer area. “This situation is a major obstacle to relations between MINURSO and the Polisario Front,” said Guterres in his report, adding that since the beginning of 2018, the Polisario also demands that “all meetings with the MINURSO Force Commander take place in the territory”(Tifariti and Bir Lahlou), which places all high-level military contacts with the Polisario Front in a “dead end”. In his “remarks and recommendations” in anticipation of the next Security Council resolution on the Sahara, the UN Secretary General expresses concern about this situation and “asks the Polisario once again to resume meetings with senior officials of the MINURSO in Rabouni”. It is therefore a firm and unambiguous injunction of the UN Chief, which frustrates the Polisario’s vain attempts to change the status quo in the buffer zone.